Heather Pace, at Sweetly Raw, is one of my favorite blogger friends. She's always kind and is consistently interesting! Her food is beautiful and original, and her photography stunning. And I'm not just saying that because she gave me the Liebster award! Thank you, Heather! I don't look at my stats all that often, but when I do I'm always pleased and grateful to see how many people from how many countries around the world stop by. It's really amazing. So, where are you? Stop and say hi, leave a comment if you can, and tell me where in world you are! What's it like? What kind of food do you enjoy there? And btw, yes, this is different from how I usually do things. I really enjoyed blogging more often during Vegan MoFo, so I'm going to see if I can make it interesting more than once a week (I'll still be doing a full day menu on Sundays). Very pretty picture! Looks delicious! Darn I miss summer strawberries :( I'm from England but currently living in Barcelona, Spain! Maybe you can put a raw spin on some Spanish dishes or classic British dishes for a bit of fun? Thank you so much for this award. Merci beaucoup! Your blog is terrific too. 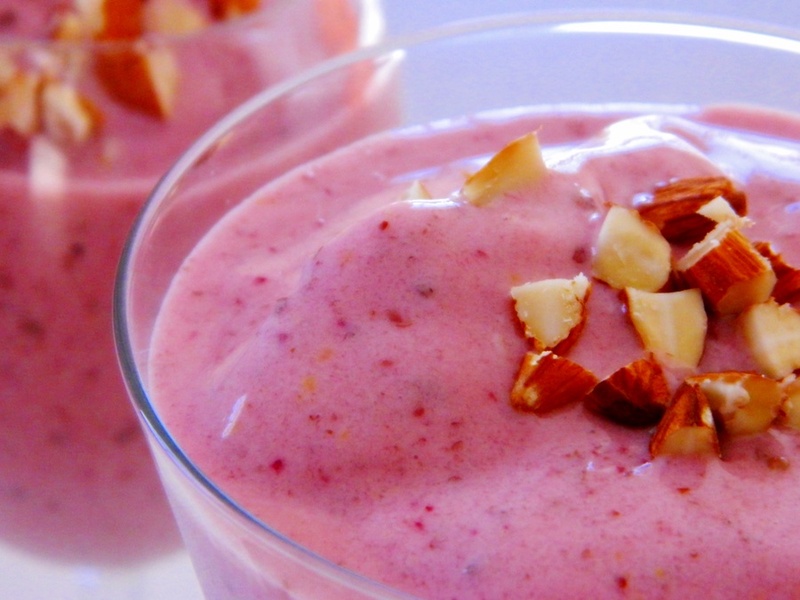 And this smoothie looks absolutely perfect (the color, the picture, everything!). Hi, TN here! Thanks for pointing out that these are *ground* flax seeds, as I imagine using whole seeds would make it mighty slimy. lol I enjoy anything vegetarian, esp. black bean tacos, and make raw dishes occasionally. I made a raw sweet potato pie filling just the other day. I absolutely love your blog, esp the pictures! Hi Graceunderpressure ... 4 tbls (2 for each smoothie) was just a convenient amount for a recipe. Emma, that's a great idea! If you have some specific ideas, let me know! Lisa thank you so much for passing the award along to me and for your friendship over the years. Means so much to me. And congrats on you receiving it, too! this looks so frothy, so smooth...so CREAMY. ughhhh want one NOW. This looks like a yummy drink to try! I actually just posted a strawberry smoothie recipe last week on my blog- which is dedicated to being raw in Indonesia (so I have lots of tropical fruits and Asian ingredients in my recipes). I like the idea of adding ground flax seeds- can't wait to try it! I am a frequent reader of you blog. I am in Germany (so I kind of stumbled across the award button :-). There's always so much inspiration here. Thank you for sharing! Hello from Brazil! I'm a frequent reader and "sharer" of your blog. I run Viva Institute, a raw vegan retreat center in the mountains above Rio de Janeiro. My dishes always focus on simplicity--very little dehydrating, fresh ingredients, low on nuts or fancy ingredients. I always come away from your recipes with fresh inspiration. Muito obrigado! even though I'm cold at the moment, that smoothie looks soooooo good! I have subscribed to your blog very soon after I first started to get into raw food almost 3 years ago. It has always been very inspiring! I started a blog myself beginning of this year - I wanted to show that it is possible to have a full time job, a family, a puppy and study for a Bachelor Degree at night at university - and live a raw vegan life!